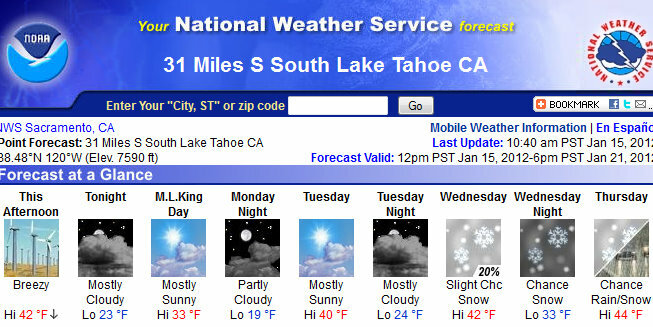 Tahoe City, CA…This Afternoon: A 10 percent chance of snow showers after 4pm. Partly sunny, with a high near 41. Windy, with a southwest wind between 25 and 30 mph, with gusts as high as 45 mph. Tonight: A 30 percent chance of snow showers, mainly after 10pm. Mostly cloudy, with a low around 15. Windy, with a west wind 25 to 30 mph decreasing to between 15 and 20 mph. Winds could gust as high as 45 mph. Little or no snow accumulation expected. M.L.King Day: Mostly sunny, with a high near 28. Calm wind. Monday Night: Partly cloudy, with a low around 10. West wind around 5 mph. Tuesday: Partly sunny, with a high near 34. West wind between 10 and 15 mph, with gusts as high as 25 mph. Tuesday Night: A 10 percent chance of snow after 4am. Mostly cloudy, with a low around 21. Wednesday: A slight chance of snow before 10am, then a chance of rain. Snow level rising to 7000 feet. Cloudy and breezy, with a high near 44. Chance of precipitation is 40%. Little or no snow accumulation expected. Wednesday Night: A chance of rain. Cloudy, with a low around 33. Thursday: Rain. Cloudy and breezy, with a high near 45. Thursday Night: A chance of rain and snow. Snow level 6300 feet. Cloudy and breezy, with a low around 33. Friday: Rain. Cloudy and breezy, with a high near 45. Friday Night: Rain. Snow level 7000 feet. Cloudy and breezy, with a low around 37. Saturday: Snow. Mostly cloudy and breezy, with a high near 37.